every thursday at 7PM from may through august! “Masskrug” translates to one-liter stein of bier and “stemmen” translates to lift. Masskrugstemmen is a Bavarian feat of strength where contestants hold a one-liter bier stein with one arm, out in front of them and parallel to the floor, for as long as they can. This isn’t your typical drinking game. 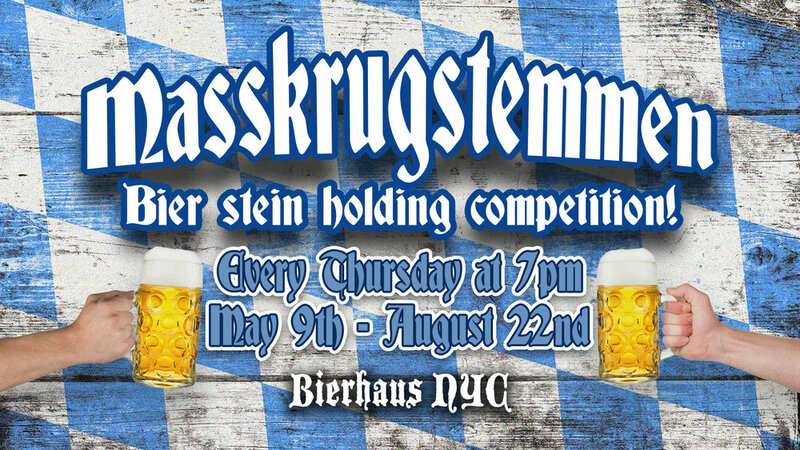 Bierhaus NYC holds their very own Masskrugstemmen competition every Thursday at 7PM throughout the summer. Two bier stein holding competitions are held, one for the women and one for the men, but people of any genders are welcome to join either group. The winners from each week will receive a Masskrugstemmen medal and will be invited back on August 29th to compete against all of the weekly winners. The female and male Bierhaus NYC champions will each win a trip to Las Vegas* to visit the Las Vegas Hofbräuhaus. They will also be invited to compete at the National Masskrugstemmen Competition in Central Park during the Oktoberfest Celebration on September 15, 2019. The female and male National Champion will each win a trip for two to Germany! (*$1,000 trip voucher to put towards flight and/or lodging and a night out for 2 at Hofbräuhaus Las Vegas). Bierhaus NYC is the home of the 2015 National Champion, Jim Banko. So how exactly does this competition work? Well, there are a few rules that must be followed in order to keep yourself in the game. 1. A one-liter stein of Hofbräu bier (weighing about five pounds) must be held using one arm, completely stretched out and parallel to the ground. Elbow must be locked, no bending! 4. The opposite arm must be straight down by your side, not supporting the body in any way. 6. Any spilling of bier is an automatic disqualification. Be sure to make a table reservation for you and your cheering section by clicking here.